The weakness in Alchian and Demsetz’s argument, according to Williamson, is that their concept of team production has quite a narrow range of application, as it assumes outputs cannot be related to individual inputs. In practice this may have limited applicability (small work group activities, the largest perhaps a symphony orchestra), since most outputs within a firm (such as manufacturing and secretarial work) are separable, so that individual inputs can be rewarded on the basis of outputs. Hence team production cannot offer the explanation of why firms (in particular, large multi-plant and multi-product firms) exist. If the transaction is a recurring or lengthy one, re-negotiation may be necessary as a continual power struggle takes place concerning the gains from trade, further increasing the transaction costs. Moreover, there are likely to be situations where a purchaser may require a particular, firm-specific investment of a supplier which would be profitable for both; but after the investment has been made it becomes a sunk cost and the purchaser can attempt to re-negotiate the contract such that the supplier may make a loss on the investment (this is the hold-up problem, which occurs when either party asymmetrically incurs substantial costs or benefits before being paid for or paying for them). In this kind of a situation, the most efficient way to overcome the continual conflict of interest between the two agents (or coalitions of agents) may be the removal of one of them from the equation by takeover or merger. Asset specificity can also apply to some extent to both physical and human capital, so that the hold-up problem can also occur with labour (e.g. labour can threaten a strike, because of the lack of good alternative human capital; but equally the firm can threaten to fire). ^ Kantarelis, Demetri (2007). Theories of the Firm. Geneve: Inderscience. ISBN 978-0-907776-34-5. Description & review. ^ Thomas N. Hubbard (2008). "firm boundaries (empirical studies)," The New Palgrave Dictionary of Economics, 2nd Edition. Abstract. ^ a b c Coase, Ronald H. (1937). "The Nature of the Firm". Economica. 4 (16): 386–405. doi:10.1111/j.1468-0335.1937.tb00002.x. ^ Holmström, Bengt, and John Roberts (1998). "The Boundaries of the Firm Revisited," Journal of Economic Perspectives, 12(4), pp. 73–94 (close Pages tab).Jean Tirole (1988). The Theory of Industrial Organization. "The Theory of the Firm", pp. 15–60. MIT Press. ^ Hart, Oliver and John Moore (1990). "Property Rights and the Nature of the Firm," Journal of Political Economy, 98(6), pp. 1119-1158. ^ Berle, Adolph A.; Gardiner C. Means (1933). The Modern Corporation and Private Property. New York: Macmillan. ISBN 978-0-88738-887-3. ^ Hall, R.; Charles J. Hitch (1939). "Price Theory and Business Behaviour". Oxford Economic Papers. 2 (1): 12–45. doi:10.1093/oxepap/os-2.1.12. JSTOR 2663449. ^ a b Archibald, G.C. (1987 ). "firm, theory of the," The New Palgrave: A Dictionary of Economics, v. 2, p. 357. ^ Ronald H. Coase (1988). "The Nature of the Firm: Influence", Journal of Law, Economics, & Organization, 4(1), p p. 33-47. Reprinted in The Nature of the Firm: Origins, Evolution, and Development (1993), Oliver E. Williamson and S, G. Winter, ed., pp. 61–74. ^ Putterman, Louis (1996). The Economic Nature of the Firm. Cambridge: Cambridge University Press. ISBN 978-0-521-47092-6. ^ Richardson, George Barclay (1972). "The Organisation of Industry". The Economic Journal. 82 (327): 883–896. doi:10.2307/2230256. JSTOR 2230256. ^ Jensen, Michael C.; Meckling, William H. (1976). 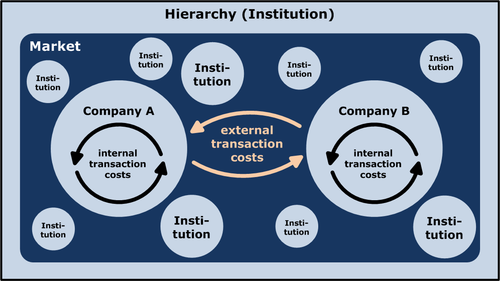 "Theory of the Firm: Managerial Behavior, Agency Costs and Ownership Structure". Journal of Financial Economics. 3 (4): 305–360. doi:10.1016/0304-405x(76)90026-x. SSRN 94043. ^ Spence, Michael A.; Zeckhauser, Richard (1971). "Insurance, Information, and Individual Action". American Economic Review. 61 (2): 380–387. ^ Cyert, Richard; March, James (1963). Behavioral Theory of the Firm. Oxford: Blackwell. ISBN 978-0-631-17451-6. ^ Alchian, Armen A.; Demsetz, Harold (1972). "Production, Information Costs, and Economic Organization". The American Economic Review. 62 (5): 777–795. JSTOR 1815199. ^ Williamson, Oliver E. (1975). Markets and Hierarchies: Analysis and Antitrust Implications. New York: The Free Press. ^ Oliar, Dotan; Sprigman, Christopher Jon (2008). "There's No Free Laugh (Anymore): The Emergence of Intellectual Property Norms and the Transformation of Stand-Up Comedy" (PDF). Virginia Law Review. 94 (8): 1787–1867. ^ Barak D. Richman and Jeffrey Mache (2008). "Transaction Cost Economics: An Assessment of Empirical Research in the Social Sciences," Business and Politics, 10(1), pp. 1-63. Abstract. PDF. ^ Special Issue of Journal of Retailing in Honor of The Sveriges Riksbank Prize in Economic Sciences in Memory of Alfred Nobel 2009 to Oliver E. Williamson, 86(3), pp. 209-290, article-preview links (2010). Edited by Arne Nygaard and Robert Dahlstrom. ^ John C. Panzar and Robert D. Willig (1981). "Economies of Scope," American Economic Review, 71(2), p p. 268–272. ^ Jean Tirole (1988). The Theory of Industrial Organization. "The Theory of the Firm," pp. 18–20. MIT Press. ^ Hans, V. Basil (December 2016). "Roles and Responsibilities of Managerial Economists: Empowering Business through Methodology and Strategy". 10. 2: 34. ^ Benkler, Yochai (2006). The Wealth of Networks: How Social Production Transforms Markets. New Haven: Yale University Press. ^ Hart, Oliver (2011). "Thinking about the Firm: A Review of Daniel Spulber's The Theory of the Firm". Journal of Economic Literature. 49 (1): 101–113. doi:10.1257/jel.49.1.101. ISSN 0022-0515. ^ Grossman, Sanford J.; Hart, Oliver D. (1986). "The Costs and Benefits of Ownership: A Theory of Vertical and Lateral Integration". Journal of Political Economy. 94 (4): 691–719. doi:10.1086/261404. hdl:1721.1/63378. ISSN 0022-3808. ^ Hart, Oliver; Moore, John (1990). "Property Rights and the Nature of the Firm". Journal of Political Economy. 98 (6): 1119–1158. CiteSeerX 10.1.1.472.9089. doi:10.1086/261729. ISSN 0022-3808. ^ Chiu, Y. Stephen (1998). "Noncooperative Bargaining, Hostages, and Optimal Asset Ownership". American Economic Review. 88: 882–901. ^ Meza, David de; Lockwood, Ben (1998). "Does Asset Ownership Always Motivate Managers? Outside Options and the Property Rights Theory of the Firm". The Quarterly Journal of Economics. 113 (2): 361–386. doi:10.1162/003355398555621. ISSN 0033-5533. ^ Williamson, Oliver E (2002). "The Theory of the Firm as Governance Structure: From Choice to Contract". Journal of Economic Perspectives. 16 (3): 171–195. doi:10.1257/089533002760278776. ISSN 0895-3309. ^ Schmitz, Patrick W (2006). "Information Gathering, Transaction Costs, and the Property Rights Approach". American Economic Review. 96 (1): 422–434. doi:10.1257/000282806776157722. ISSN 0002-8282. Crew, Michael A. (1975). Theory of the Firm. New York: Longman. p. 182. ISBN 978-0-582-44042-5. Clarke, Roger; McGuinness, Tony (1987). The Economics of the Firm. Cambridge: Blackwell. ISBN 978-0-631-14075-7.